I try to go out to Sag Harbor to visit my grandmother as often as I can during the summer. It’s wonderful to see her, escape from the city, and get some much needed beach time in. It’s also an amazing time to test out all of the recipes that I’ve been dying to try. Everyone in my relatives are outstanding cooks, so there’s a high bar of excellence that can sometimes be intimidating. Since it was just Meme and me last weekend, I was willing to go bold without the fear of failure. For the Fourth of July my sister Martha and I made roasted cherry and goat cheese ice cream. The ice cream was amazing but the best part by far were the sticky cherries that were a perfect balance of tangy and sweet. Ever since then, I’ve been brainstorming other uses for them. Since I’m a big fan of custards (meyer lemon and vanilla custard is delicious! ), I thought why not try a panna cotta. Panna cotta is traditionally made with cream. In this recipe I did 50% cream and 50% buttermilk to balance the sweetness of the cherries and create a more dynamic flavor profile. Sprinkle gelatin over cold water in a medium bowl. Let sit for at least 5 minutes. Heat heavy cream and buttermilk in a thick bottomed saucepan until very hot. Alternatively, heat in a microwave-safe bowl at one (1) minute intervals. Whisk hot cream and buttermilk into the bowl with the gelatin. Add vanilla and continue to whisk until fully combined and smooth. Dampen a dish towel with neutral flavored oil. Lightly grease 6 ramekins. Pour the mixture into each ramekin, dividing it equally. Cover loosely with plastic wrap and refrigerate for at least four (4) hours and up to 12 hours. **NOTE: If you don’t have ramekins, use a similarly shaped ceramic or glass container such as a small coffee mug or a small bowl. Pit cherries, cutting each into quarters. Toss cherries, sugar, lemon juice, and corn starch in a oven safe dish. TO SERVE: If you would like to unmold your panna cotta, run a thin knife around the edge of the ramekin lightly pulling inwards, separating the custard from the side of the dish. Top the ramekin with a dessert plate and flip. Lightly tap on the base of the ramekin if necessary. 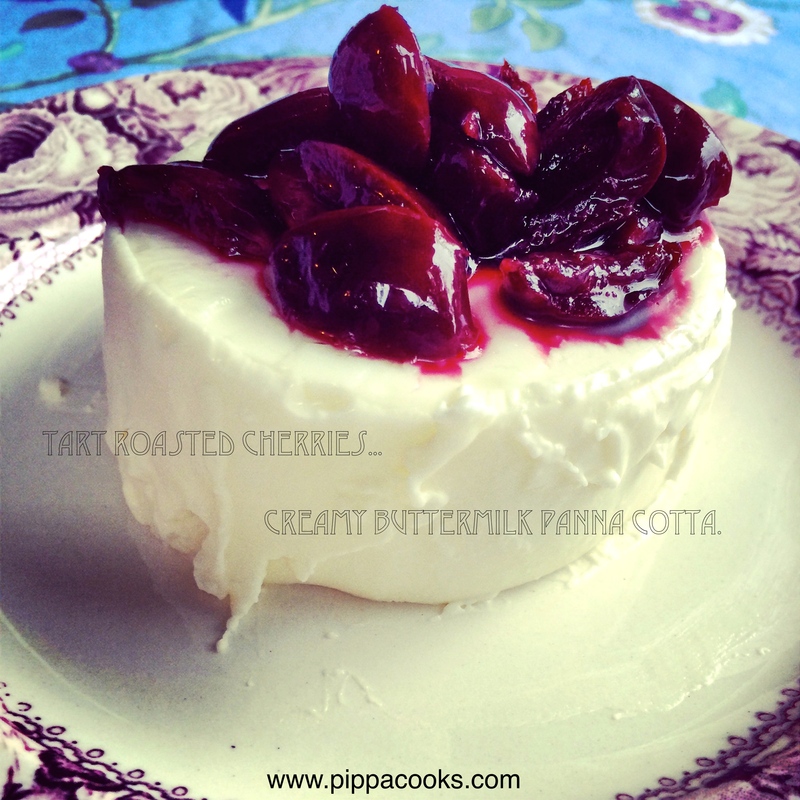 Top your panna cotta, unmolded or otherwise, with a heaping spoonful of roasted cherries. Serve with a crisp white wine or dry Champagne.